That looks good! Nicely done. My mom complained I didn't cook them right, although they were sort of perfect. That's my mom. Toons, Your final image is a work of art. I will check you out more often. cookicrumb, It is about time. I am really looking forward to when you and Zoomie battle it out with your matching grills. P.S. You are the most perfect person in Marin that I know. That is sweet steak perfection! I like the way you carved it and reassembled. Five stars for you sir! Greg, Thanks, it was one tasty steak. We even had sandwiches the next day. Three Dogs BBQ, I think it was the other way around. I am lucky that I got any steak. That's one big steak ChileB! I hope the dogs got a couple bites. 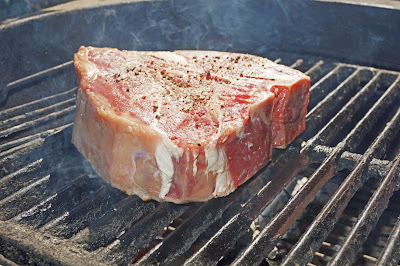 I was just thinking about T-bones yesterday when steak shopping. When I lived in Kansas that's the only steak that we ever purchased. (no Toto jokes please) I don't think I knew to grill any other cut until I moved to Colorado. 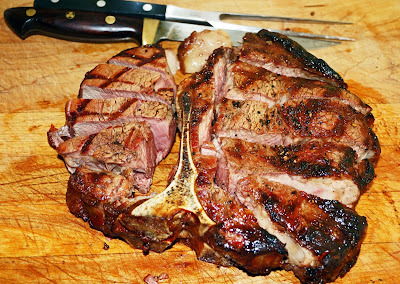 I think the flavor of a t-bone is just about the best. Lea Ann, I bet you could get some great steaks in Kansas. I was lucky to get several bites let alone the doggies getting any. T-bone, rib-eye, sirloin, and New York:the steak in front of me is the best. Well Mr Chilibrown this article has made me want to stock up on meat for a Father's Day BBQ. Is there any place in the East Bay that I could go purchase meat like this? 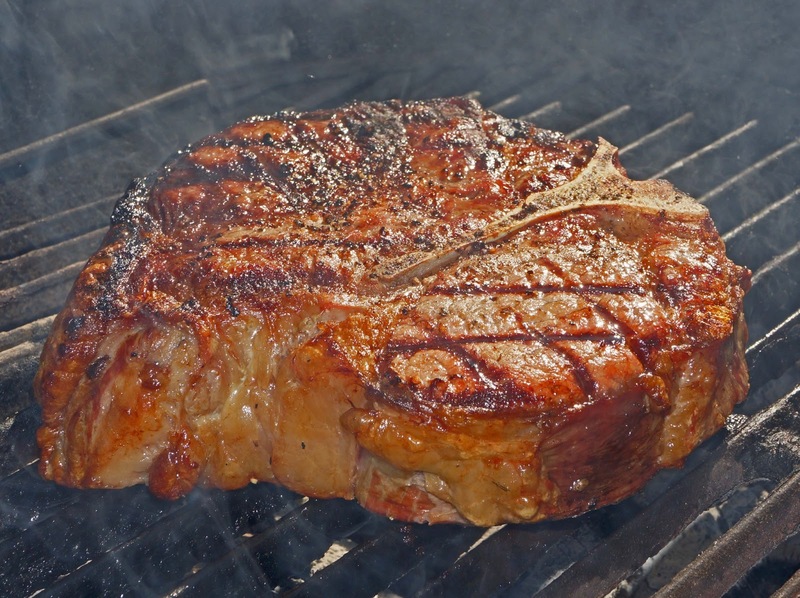 If not meat like this, something close, with a good price to quality ratio. Hey Dan, I seem to remember you living in San Lorenzo so I will reccomend Barrons Meats in Alameda for quality but high price. If you are looking for value Costco of course but you will not get a 3 pound beauty like this one. 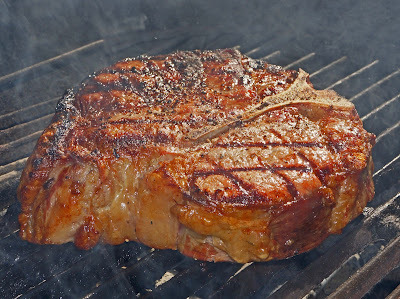 I highly reccomend Raley's Black Angus.We go there for value and quality. The butchers will cut you a custom cut if you ask.To experience meat that is special a road trip to Santa Rosa to Willowside Meats and splurge at 15 dollars a pound is worth every cent and more. You will not be sorry. Thanks Chilibrown. I will be making a trek to Santa Rosa soon. You know me and my addiction to wine. I'll be headed out to the Bottle Barn in Santa Rosa. Great White said the farmers market was also off the hook. Now I guess I'll be going to Willowside Meats for great pork & beef. I think I need to wipe a tear from my eye, that is a steak approaching a religious experience!